These creamy, delicious, and very yummy White Chicken Enchiladas are not only seriously good but are so simple and easy to make. 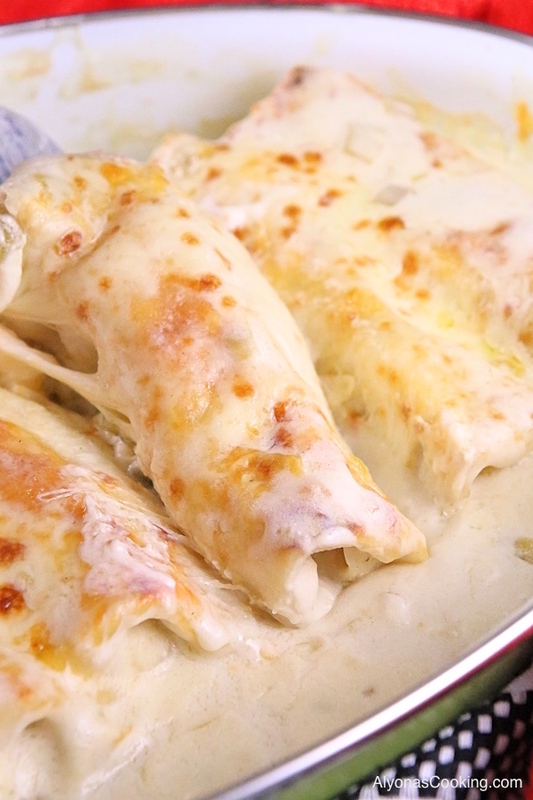 Sour cream and green chilies make for one creamy sauce that bubbles away when baking, creating a gooey, creamy, and excellent chicken enchiladas. After discovering this recipe from Joyful Mommas Kitchen, I went ahead and made these. I guess I was drawn by the simplicity of the recipe and of course how creamy and yummy it looked. This recipe had never let me down, and with many positive reviews for this recipe, you can be sure this is a good one. Someone even commented “SOOOOOO GOOOOD!! Super easy and yummy. This is one of my go-to recipes for an easy meal”. You probably get the point. 1. Preheat oven to 350 degrees. Grease a 9×13 pan or any baking dish. 2. 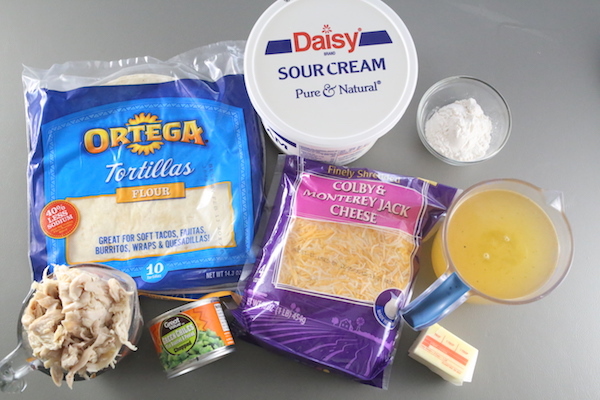 Mix chicken and 1 cup cheese. 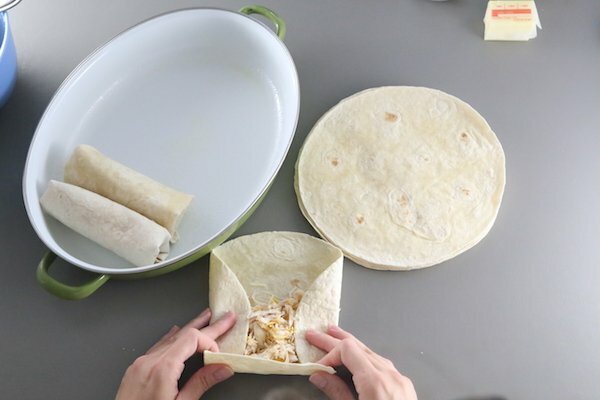 Roll up tortillas and place into the prepared pan. Note: I used a traditional rotisserie to shred the chicken. 3. 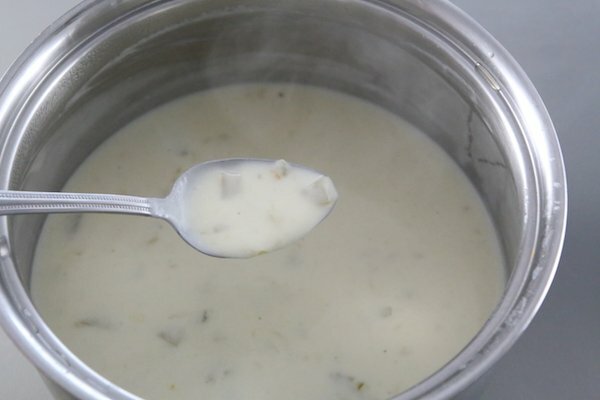 In a saucepan, melt butter; stir in flour and cook for 1 minute. Add broth and whisk until smooth. Heat over medium heat until thick and bubbly. 4. Stir in sour cream and chilies. Do not bring to boil. You don’t want curdled sour cream. 5. Pour over enchiladas and top with remaining cheese. Bake for 20 min; then under high broil for three additional minutes to brown the cheese. Note: I used the addition of mozzarella cheese during broiling. 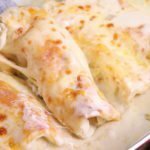 These creamy, delicious, and very yummy White Chicken Enchiladas are not only seriously good but are so simple and easy to make. Preheat oven to 350 degrees. Grease a 9x13 pan or any baking dish. Mix the chicken and 1 cup of cheese. Roll up tortillas and place into the prepared pan. In a saucepan, melt butter; stir in flour and cook for 1 minute. Add broth and whisk until smooth. Heat over medium heat until thick and bubbly. Stir in sour cream and chilies. Do not bring to boil. You don't want curdled sour cream. 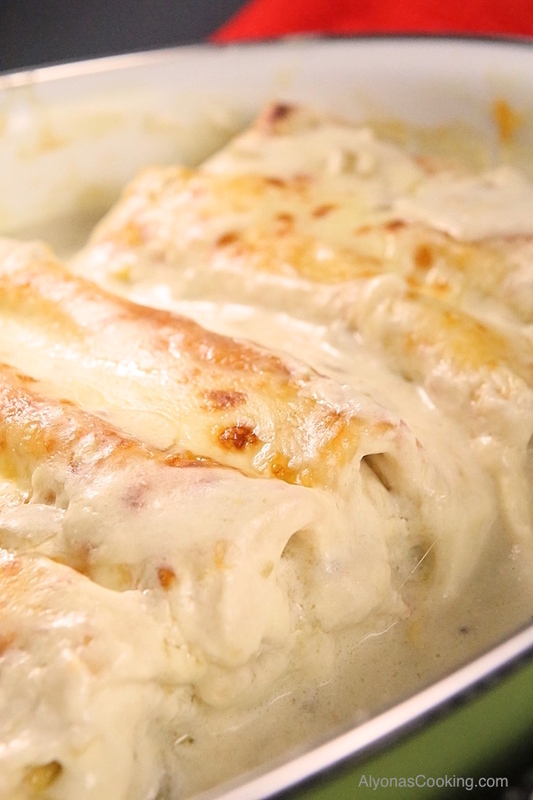 Pour over enchiladas and top with remaining cheese. Bake for 20 min then under high broil for three more minutes to brown the cheese.